The beautiful floral quilt set features its color application and combination which deserves to be a new and featured kind of production for this year. 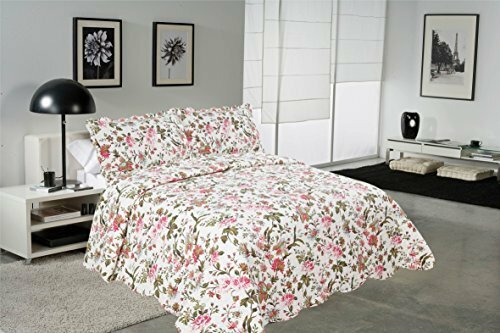 The multiple floral patterns and the vibrant colors can easily follow the trend of fashion elements which will bring vitality and luxury to your bedding room. Mohap emphasis the concept “high-quality” as the guidance of development, as for the design of “exquisite wavy computerized embroidery”, we hope this strict stiching will make the quilt more smooth and non-wrinkle and also prevent the innside filling fall adding the longevity and durability than other quilts. As a new shop, we paid too much attention on the survey about the customers’ requirements, we also discard the dross and select the essential from other previous textile shops. So we combine“convenience” and“comfort” with the “high-quality” together, now, it become a good way for us to pursuit, as for the material we use for this kind of quilt, we select the high-quality cotton filling and use ultra soft brushed microfiber for both sides making this quilt set skin-friendly and antiallergic. Some customers are curious about the problem: is the quilt set suitable for summer or winter? In fact, our beautiful quilt can be used for all year round, on one aspect, the quilt set is not too heavy and the material we use can make the quilt breathable which is suitable for the hot summer, on the other aspect, the quilt set is a little big and filled with good quality cotton which can keep your body warm in winter. In some cooler places, this quilt set can be used as a beautiful decoration, we suggest you to cover it above your duvet or other kind of thick quilt which can isolate the chill in winter and also make your bedroom vibrant. SIZE INFORMATION: (king size) | 1 x wavy quilted bedspread: 90″ x 98″ (230 x 250)cm and 2 x pillow shams: 19″ x 27″ (50 x 70)cm with 5cm wavy edging. MATERIAL: the reversible quilt set features the exquisite wavy computerized embroidery on both sides, with the high quality cotton filling. it affords a supreme softness, as well as offering enhanced longevity and durablity. EUROPEAN IDYLL STYLE: the quilt set is designed to be gorgeous by utilizing printing which combines with multiple small flowers and bright colors, at the same time the delicate floral fabrics accented with ruffles along the seams gives this quilt set a vintage-chic look. A PERFECT CHOICE: the light pink and corresponding green will add luxury to your bedding and home decoration especially perfect for this beautiful SUMMER, even better is that our beautiful quilt set also will be a perfect companion (sofa cover) for your sofa. EASY TO CARE: machine wash gentle cycle in cold water separately, no bleach, tumble dry Low. any quality problem, feel free to contact with us.